I guess if you're writing a preview of December 2009, you kind of have to put Avatar at #1, don't you? Even if you don't really feel like it? Even if you think there's a chance that those vicious Chipmunks might re-enact their '07 coup, or that people will really dig The Lovely Bones - all while Avatar is ignored by the masses, who frankly can't come up with a reason why they should get out there and see it? So here it is - the much-anticipated follow-up to the shocking box office events of spring '98, when Titanic repeated at #1 again, and again, and again. 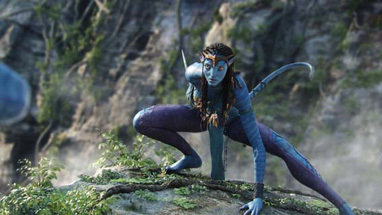 There're a lot of flashy special effects, some considerable buzz, and a lack of competition in the big action department, so Avatar ought to do at least fairly well. If there's a real audience embrace of the picture, we could see some legs drag it on to the next level. But for now, I'll go with my gut.